... by trying Manito Tap House, which currently has quite the colorful dish going. Dubbed the Green Chili Mac & Cheese, it is exactly what it's advertised as: Mac and cheese with green chilis. It might sound simple, but there's a lot going on here. The chilis, for example, are a mix of jalapeños, poblanos, and serranos. It's not crazily spicy, but the peppers certainly add a bit of a kick to the palette. This is not a vegetarian mac and cheese, and the somewhat predictable chicken and bacon have made their way into the mix. Hey, predictable doesn't have to be bad, and they do make for a more hearty meal. The cheeses and Jack and cotija, which, when paired with a healthy dose of cilantro and aforementioned peppers, gives the dish a decidedly Mexican feel. So is it the $100 mac and cheese? That's up to the masses to decide, I suppose. Or Patrick. We quite enjoyed Manito's take on the dish, and while it's not your grandma's mac and cheese, I, personally, would say it's better than Saranac's offering. You might disagree, but you should still check this out. It's a good take on mac and cheese either way. 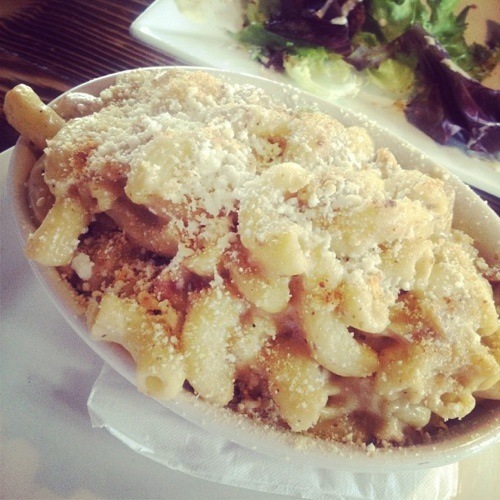 Vote for The $100 Mac & Cheese Challenge: Manito Tap House: It’s your civic duty!